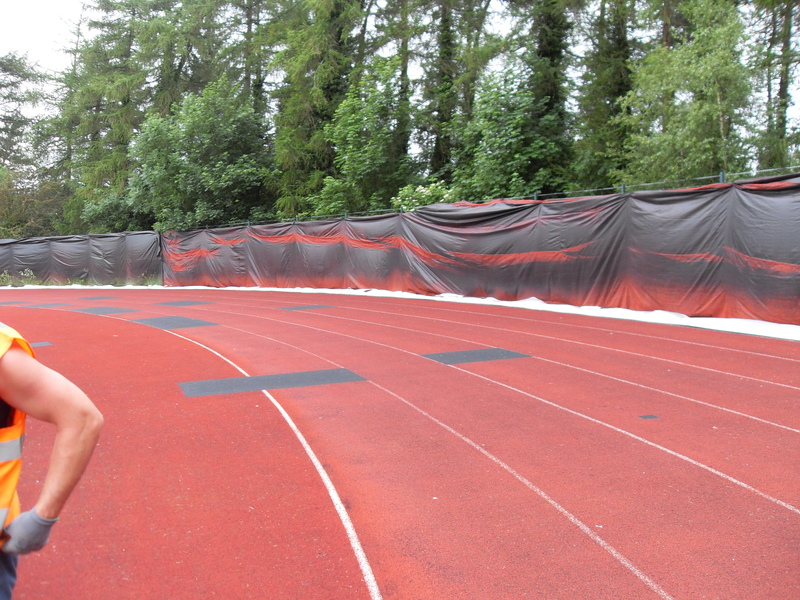 Our team of experts can carry out athletics track repairs for existing surfaces which may have become damaged due to heavy use and weathering. 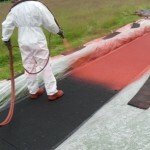 This could happen to polymeric rubber flooring or needlepunch turf, and we can fix problems with either of these. It’s important to have a sports surface in top condition to ensure that it’s safe to use, so we’d recommend checking for damage on a regular basis. We’d be happy to speak to you about all of the services we offer so don’t hesitate to get in touch with us today. You can simply fill in the contact form on this page and let us know what you’re looking for. One of our experts will respond with some more information on the process as well as a quote for any work which needs to be done. 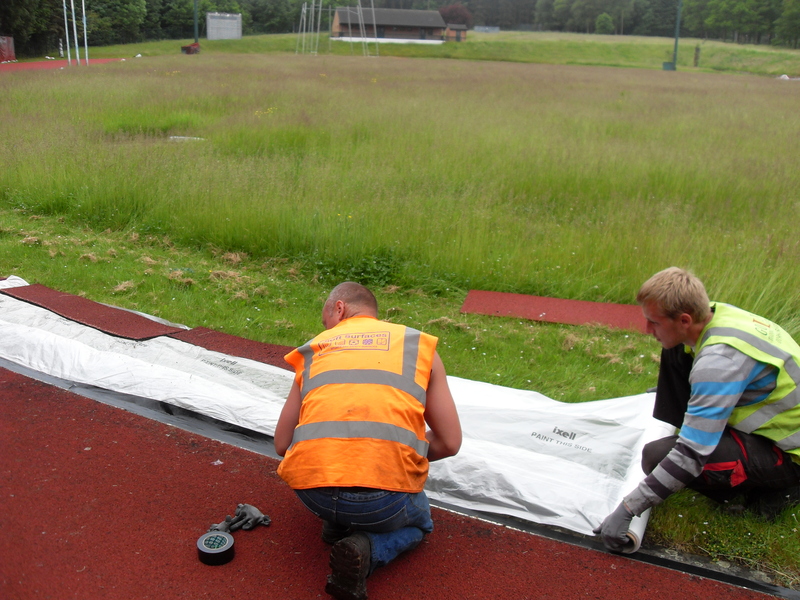 It may be necessary to carry out athletics track repairs if your outdoor sport surface becomes worn out or damaged, these repairs could include fixing joints and seams or filling in areas which may have been damaged by vandalism. The type of athletic track repairs which are carried out depend entirely on the specification of the runway surfacing and the conditions of the facility. Making sure a regular maintenance plan is put into place for your athletics facility will help to reduce the need to fix damage. This maintenance could include brushing to remove dirt and debris, as well as applying chemical treatments to prevent contamination from moss and algae. As an athletics surfacing contractor, we are able to offer you advice and services to help you clean and maintain your sports facility and keep it in the best possible condition. 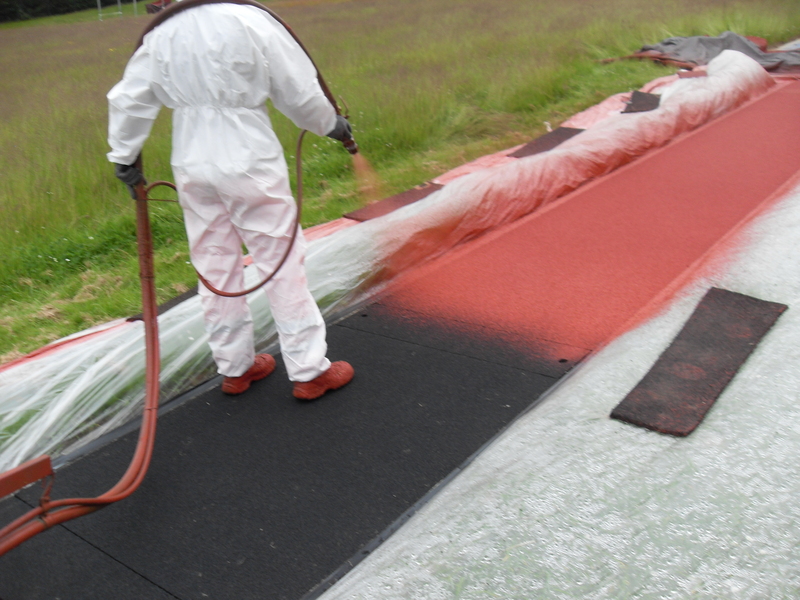 Take a look at the video below which shows our team completing a repair project for a polymeric surface. This facility had some areas of damage where the rubber flooring had become worn and developed holes and cracks. We filled in these gaps with a new textured spray coat of EPDM and then applied a new spray coating over the top. Once the retexturing process was complete, we applied new white line markings to the surface to mark out the individual lanes and improve the overall appearance. After all the work had been done, the facility looked as good as new and had been restored to its original performance qualities. If the athletics surfacing is not looked after properly this could lead to the flooring losing its porosity and starting to become flooded which would make the facility unsafe and unsuitable for use. 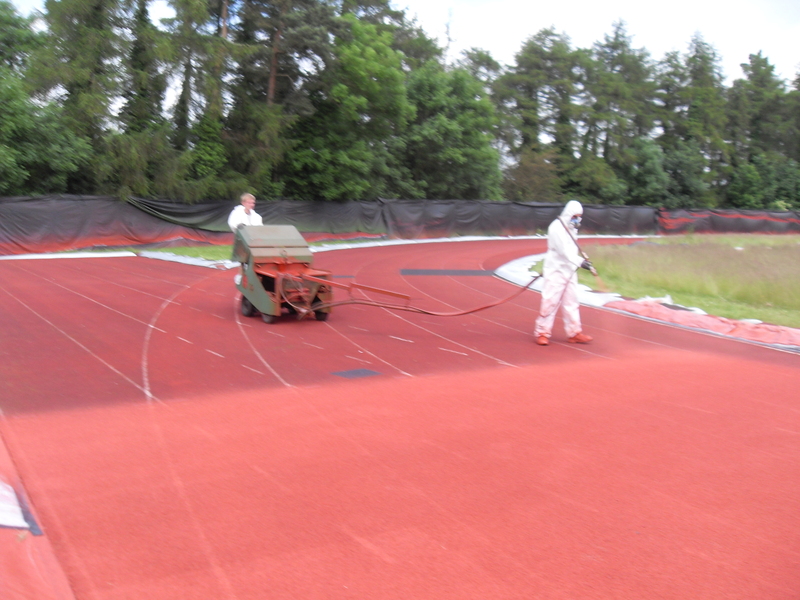 If the surface of the running track does become damaged, it is vital that athletics track repairs are carried out as soon as possible to prevent the damage from becoming worse. 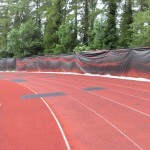 Leaving a worn out or damaged athletics track untreated for a long time could mean that the facility needs to be completely resurfaced which will of course be more costly than some simple repair work. Having extra accessories such as sand pit covers for long jump runways can also help to maintain the athletics surfacing and prevent any damage for as long as possible. These are designed to stop dirt from getting into the landing pit when it is not in use. There are also other items available such as rakes to keep the sand evenly distributed, and even wheel away covers to protect the area. For running tracks, you can use a stiff brush to remove debris from the flooring and stop contaminants from getting into the pores. In many cases, leaves or mud from an adjoining field can land on the surface and sink into the pores making them blocked. This is how the facilities become flooded, so it’s important to brush these away before problems occur. 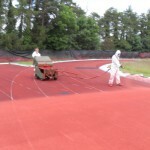 As experienced contractors we have been offering athletics track repairs throughout the UK for many years. We’ll be able to offer advice on what work may be required for the surfacing and provide an affordable price to complete the repair. If you need any further information about maintenance for athletics facilities, have a look around the rest of our website and please fill in the contact form if you’d like to send us an enquiry or receive advice about costs and quotes.